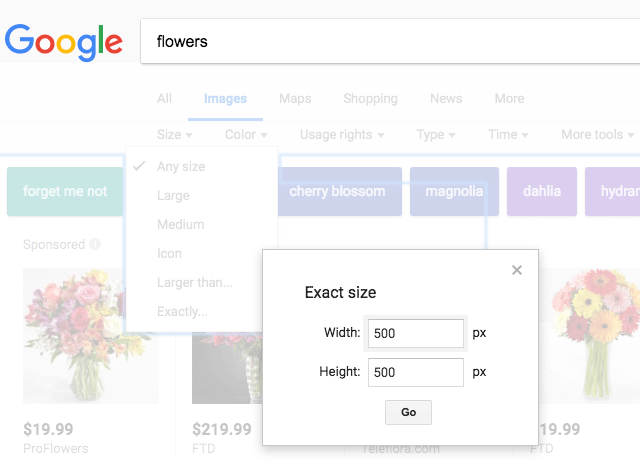 If you go to Google Image search and search for any image, let's say flowers, and then go to the search tools and select the size option. Then you pick "exactly" and enter in a size and hit "Go." Nothing, absolutely, nothing will happen. There are a bunch of searchers complaining about this issue over the past week in the Google Web Search Help forums. Google's Andy B. said today that he hopes this is resolved within a week. He wrote "the team has found and verified a fix for this issue, but unfortunately it won't be live for ~1 week due to the nature of how it needs to be rolled out. Understand this is not ideal, but we appreciate your patience in the meantime." Personally, I don't think I ever used this feature, have you?